The Early Modern Network is a collaborative research experiment, a week-long Summer School in which postgraduate students and early-career researchers from leading universities interrogate current approaches to the discipline of Early Modern History and grapple with pressing methodological questions. The Early Modern History Network began in 2011 as an informal initiative between the universities of Princeton, Oxford and Münster. The first workshop was in Oxford, hosted by St John's College’s Research Centre; the second workshop was at Münster (2012), the third workshop took place at Princeton (2013). In 2014, the fourth workshop returned to Münster. 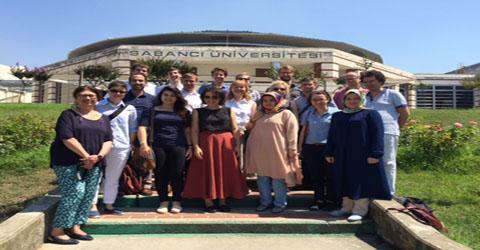 In it’s fifth year now, the network expanded to include Sabancı University in Istanbul. Over the past four years this exciting collaboration has evolved from a two-day workshop into a dynamic, responsive week-long Summer Institute in which postgraduate students, early career researchers and senior scholars have addressed topics including ‘Visual Cultures’, ‘Global Early Modernity’, ‘The City and Urbanism’ and ‘Emotional History’. This year’s topic is ‘Religion and Belief’.